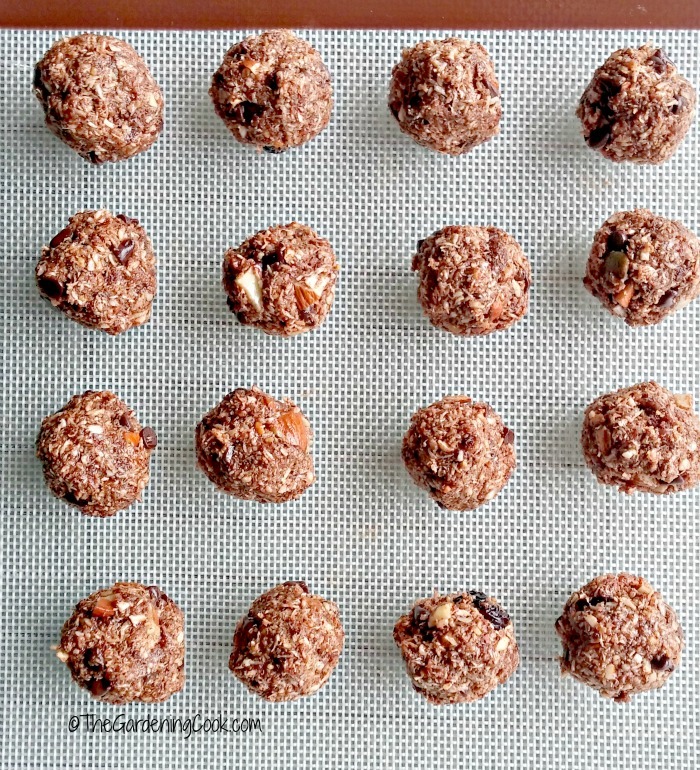 Paleo Espresso Chocolate Hazelnut Energy Bites. Are you looking for an afternoon snack or after workout treat that is Paleo and super delicious? 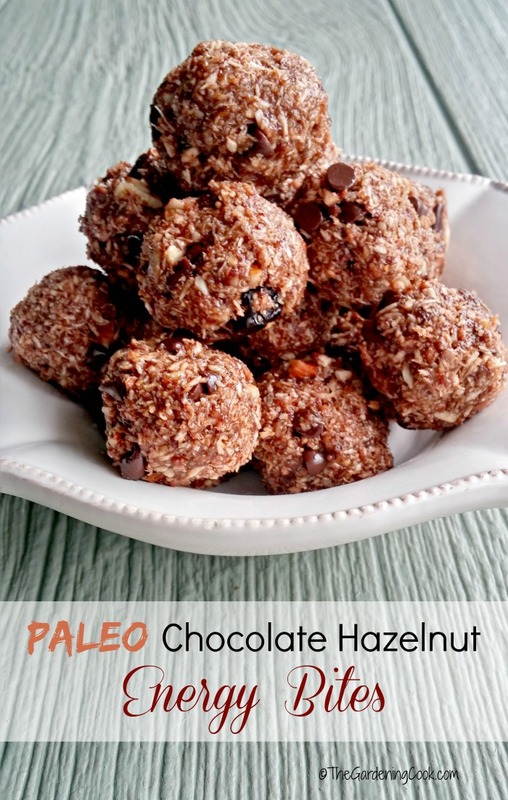 Try one of the Paleo espresso chocolate hazelnut energy bites. They are loaded with goodness, and so, so tasty. These Paleo Espresso Chocolate Hazelnut Energy Bites pack a nutritious punch in one delicious mouthful. I’m fond of any sweet treat that is no bake. I love how quickly they come together and how well they store in the fridge just waiting for that moment when you need a sweet little pick me up treat. These delicious Paleo espresso chocolate hazelnut energy bites are not only easy to make, they have a wonderful flavor that will make it hard to just eat one! But even if you have an extra one (or two), you won’t need to worry. They are full of healthy goodness. Just check out these ingredients! I used pure maple syrup, organic honey, unsweetened coconut flakes, dairy free mini chocolate chips and Steve’s Paleo Chocolate Hazelnut butter. And Espresso? Why that comes in the form of one of Steve’s PaleoKrunch grainless granola bars. 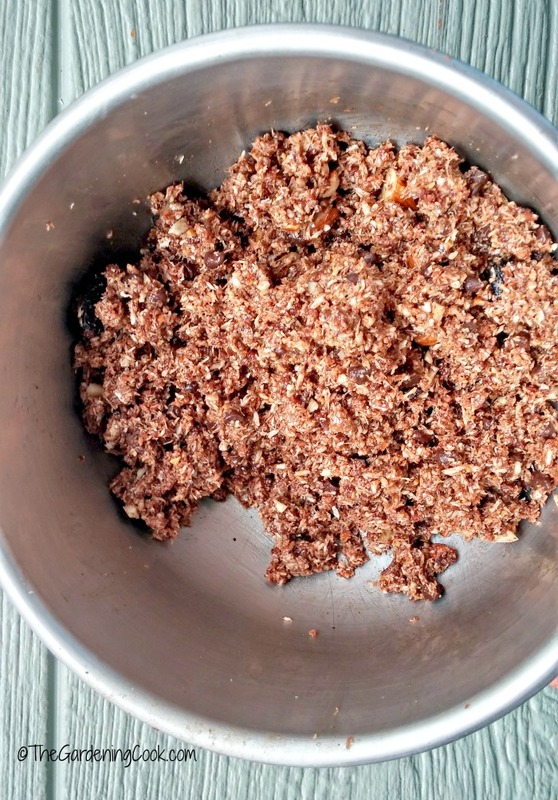 Combine everything together, and you have a bite made in Paleo heaven. My husband tasted these first since he is the coffee drinker in our house. He adores them. Me…not so much of a coffee drinker (as in I don’t even like the smell of it) and I LOVED the taste of these bites. Just a tiny hint of espresso and so much deliciousness in one tiny bite! I could not believe how quick and easy these were to make. 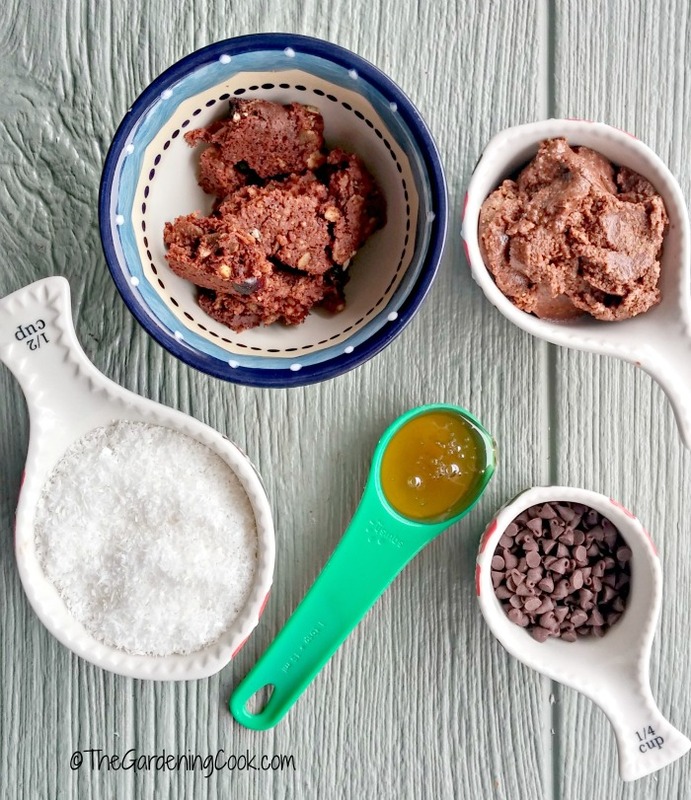 Everything goes into one bowl and the ingredients get mixed with your hands. Take out tablespoons of the mixture and roll it into balls and place on a silicone mat that is place on a baking sheet. Pop them into the fridge for about 1 hour to set. Voila! These Paleo espresso chocolate hazelnut biters are perfect little balls of healthy goodness that will satisfy your sweet tooth, your hunger and your eyes too! They have the best of all things energy. Protein, sweetness, crunch and such a delicious taste. This one is a keeper, folks. You will make them again and again, which is great, seeing as how easy they are to make! What is your favorite after workout snack? Please share in the comments below. 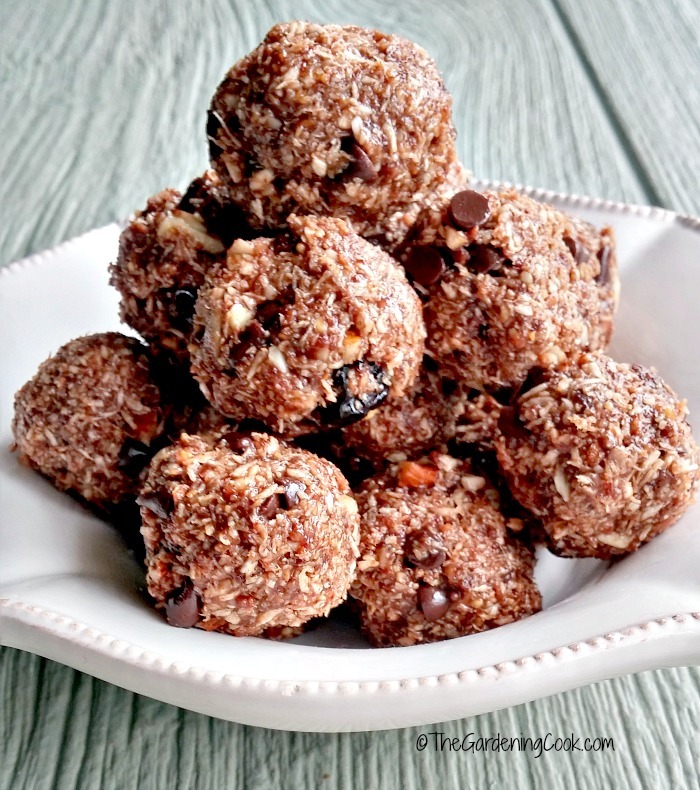 Paleo Espresso Chocolate Nut Energy Bites. Combine everything in a large bowl. Using your hands combine the ingredients well. Take tablespoons of the mixture and shape into small balls. Place on a silicone baking mat on a cookie sheet in the fridge for 30 minutes until set. Store in an airtight container in the fridge. Enjoy. The only problem I see with making these, is not being able to stop eating them! they sound wonderful! LOL. That was my problem too!